I remember when Cuphead was initially announced, all the way back in 2014. I remember specifically, the relief I felt when it was confirmed that the game would also be available on Windows, meaning I could actually enjoy it, as I did not own an Xbox One console at the time. Of course, after the game had released, I found myself in love with the hard but fair gameplay, its perfect 1930s inspired, cartoon aesthetics and its NES levels of responsively fluid controls. Yet, even still, there was something nagging away at me, and no, it wasn’t the frustrations of having to die over and over again. 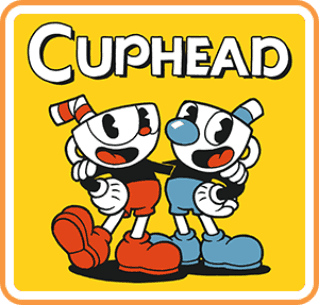 What was bothering me about Cuphead, was simply the fact, that this fantastic game which I was playing, wasn’t available on my at the time, still relatively new, Nintendo Switch. Of course, the game being on my PC absolutely did not deter me from enjoying the title; in fact, I enjoyed the game so much, I began to carry an Xbox 360 gamepad with me whenever I went out, just in case an opportunity to play Cuphead on my Surface would arise. 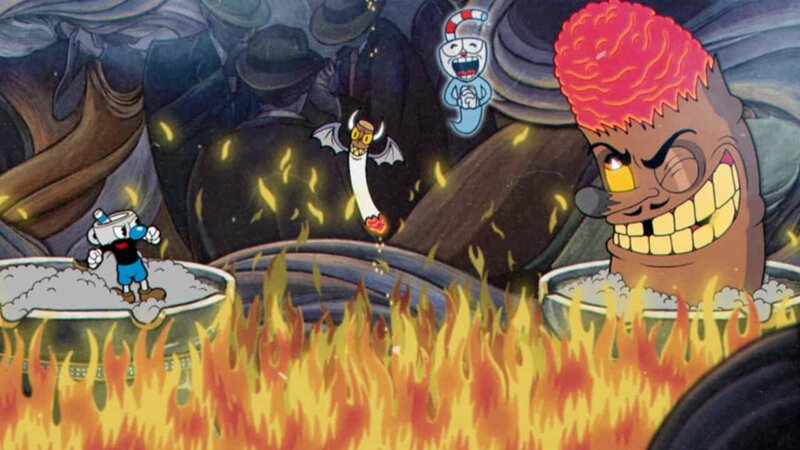 With the release of Cuphead on the switch, I can finally, wholeheartedly confirm, that Cuphead on the switch, is hands-down, the definitive way to enjoy Studio MDHR’s shoot ’em up, treasure. For the Nintendo die-hards, or for those who haven’t yet had the chance to check out the previous incarnation of Cuphead, on the Xbox One ecosystem or PC/Mac; Cuphead, in essence, is a love letter to the by-gone-era of side-scrolling, shoot ’em-ups. The core gameplay is an eloquently crafted concoction, infused with gameplay elements reminiscent of classic titles, such as Contra, Gunstar Heroes and yes, even Dark Souls, (particularly, in reference to the tough-as-nails boss encounter levels). Studio MDHR has done a masterful job in capturing and bringing the nuanced plasticity found in cartoons from the 1930s to Cuphead, visuals that look especially sharp when playing in handheld mode on the switch. Thanks to the simple controls of Cuphead, the title translates really well when played with the Joy-Cons or the Pro Controller. As a side note, I recommend remapping the shooting and jumping to the ZL and ZR triggers, which I found made the game extremely comfortable to play, during longer sessions when undocked. 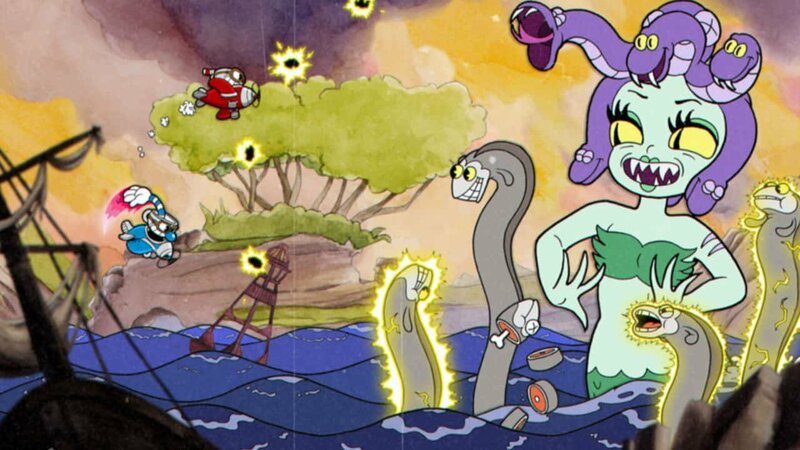 Cuphead augments its typical bullet-hell gameplay conventions by giving players access to a plethora of powerups and special items. These essential powerups can only be earned by collecting distinctive, gold-coins, most commonly found within the run and gun levels, as rewards for finishing off bosses and sometimes, even hidden around the overworld map. 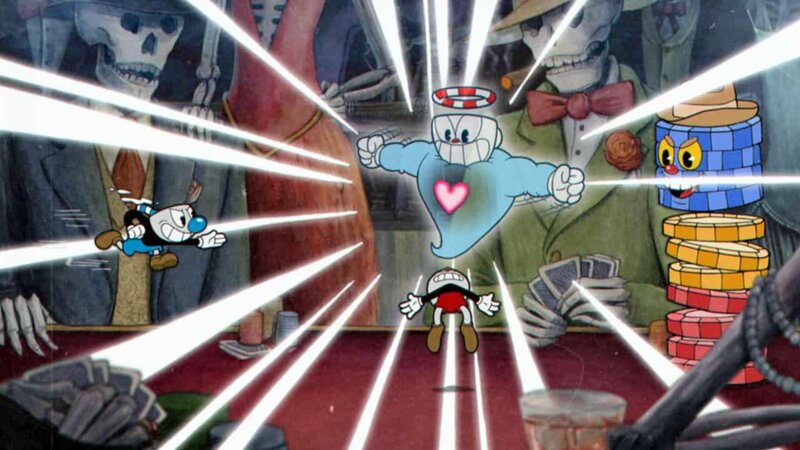 Both the titular Cuphead and his brother, Mugman are able to swap between two bullet-types, in addition to having access to a special attack which builds up over time, or whenever the player successfully parries specific (pink) targets. As of the writing of this review, Cuphead on the switch seems to offer a few subtle visual improvements and changes from its original release. 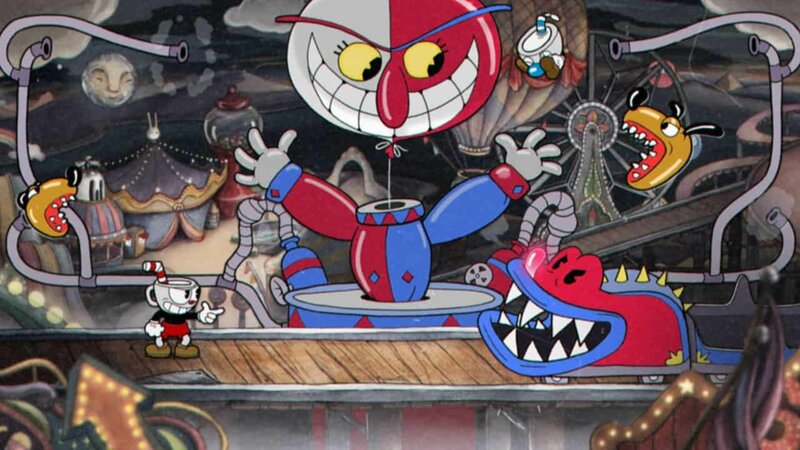 These changes include the ability to choose either Cuphead or Mugman when starting the game, new taunt animations for both brothers when facing off against bosses, and finally, a much less aggressive old-timey, film scratch filter during gameplay sequences. The detachable joy-con controllers on the switch are another feature that Cuphead takes full advantage of, offering fans the opportunity to rope-in friends (or strangers) to help them in impromptu sessions of fun and frustration. It will be interesting to see how Cuphead evolves on the switch, especially after the Xbox Live integration, which currently still has no release date. As it stands, Cuphead is a great addition to the Switch library, it’s also a game that just feels right at home on a Nintendo platform, thanks to its colourful aesthetics and old-school difficulty. I can’t recommend the game enough, even for those players who may have already played the title during its initial release on other platforms. As it stands, Cuphead is a great addition to the Switch library, it’s also a game that just feels right at home on a Nintendo platform, thanks to its colourful aesthetics and old-school difficulty.